This is a guide for digital nomads in the “green capital” of Kampot Cambodia. 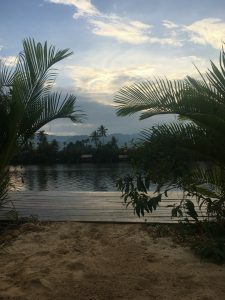 I recently enjoyed three weeks in Kampot, mostly to unwind in glorious weather, enjoy affordable food and accommodation, and relax in a green-friendly riverside town. It’s also where I recovered from a recent long distance breakup on the road. It’s been sad, with some times and places feeling like a prison – but what a superlative backdrop to heal and find inspiration in life. Kampot was an excellent experience, and a place I quickly knew I would be back the next time I return to South East Asia. 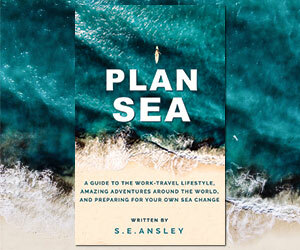 With national parks, islands, and proximity to so many wonderful places around, it’s almost the perfect digital nomads paradise. Kampot is a sleepy, slow paced, chilled out place. There’s not much motivation to work too hard, with nature and fun places to explore during consistently excellent weather. There is a lot of weed being smoked, and cheap alcohol at a plethora of bars. Lots of music and parties. There is an abundance of wifi-enabled places, cafes with good food and coffee, and affordable guesthouses. 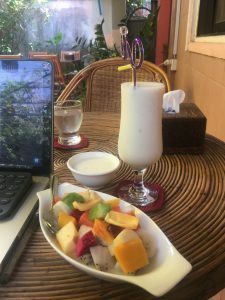 It ticks a lot of boxes on the desired lifestyles of many digital nomads, and there are a lot of them based in or stopping through Kampot. Most properties and venues in Kampot appear to have satisfactory, freely available wifi. As I was in Cambodia for a month, I acquired a SIM card for a few dollars, with data that lasted all month. SIM cards are excellent back ups for access to the Internet – South Korea is the only country I definitely didn’t need one, even for my 3 months there, but it’s rare. Café Malay – The Garden Café – This is a lovely spot, where you can work from outside in nice weather. Delicious food and drinks. Wifi was satisfactory. Most of the time, I worked from my guesthouses, using their wifi and ordering food and drinks accordingly. There are heaps of attractive, comfortable guesthouses, hostels and hotels in Kampot. 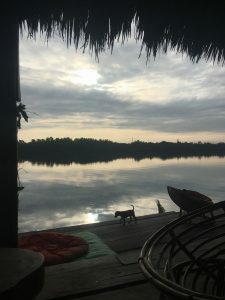 High Tide – Perhaps the sweetest spot of all, the breeze off the river in the shade at High Tide is perhaps the most perfect climate I have felt anywhere on the planet. Hammocks are $1-2 a night, dorm rooms from a few dollars, and even a private double for $5-6. The food and drinks are excellent, and it is green friendly to the max. Super chill. 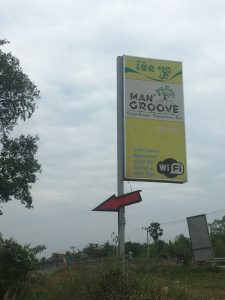 Man’Groove – I spent 10 days at Man’Groove, around 15km away from Kampot down the road to Kep. This is where my break up went down remotely, and it felt like a prison at times, mostly thanks to the iron bars in my windows. Really chill spot. My own double bedroom for $5 a night. Drinks were good, food was ok. Wifi was the best. Movies most nights. The music was absolutely terrible, in a loop of bad cover songs, but guests are encouraged to plug in their own tunes. Meraki – This is an awesome locale! Beautiful, serene, terrific food and drink. Further from town. Multiple tranquil areas to work from. Wifi is good. Intellectual guests. I was in the shared room for $6 a night, and I was upgraded on my last night when there was a leak in the original room. A romantic place for couples. For camping enthusiasts, you can always set up your tent and camp at nearby Bokor National Park. I’m stunned there is no other mention of this online, for camping or tents overnight in Bokor National Park. This will become the #1 article on the subject! 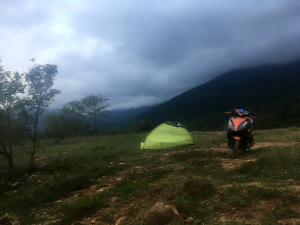 I’m happy to share that I successfully camped overnight at Bokor, with my scooter, tent, Burning Man sleeping bag, and a small backpack. This was soulfully significant to me in that the last time I’d camped in that tent and visited national parks, was with my ex during our time exploring South Korea. Our essence, scent and sweat were in that tent, all our adventures were readily remembered. That’s why I really wanted to camp alone, and try to mentally move past these emotions. The weather was not helpful, pouring down with torrential rain for hours. This immediately soaked me, and made it uncomfortably cold at the top of the mountain. All my clothes and spare clothes were wet. I took refuge in an abandoned building near the top. It wasn’t pleasant, I was depressed enough as it was, and I thought about giving up. If at first you don’t succeed… try to pitch that tent! On my way down and out of the mountain, likely heading to High Tide to crash on a hammock, a voice in my head urged me to try. Spotting an unmarked exit, beside an entrance marked with parking sign, I rode the trail for a minute, and it took me to a secluded, flat clearing – ideal for camping. I thought, “why not?” and proceeded to erect my tent successfully, before the rain started again. Pleased at my new surroundings, I was excited when the rain stopped and I took a look outside. The mountain, stars, water – beautiful! I celebrated with some pre-rolled green. A little later, when nature called, under the ceiling of the stars, it felt like raindrops – but they were mosquitoes! Sure enough, there were 5-6 mosquitoes waiting for me inside the tent, that had to be dealt with. I don’t like killing or hurting anything, but there’s no way I’d sleep with mosquitoes inside. I conducted some physical and mental exercises before falling asleep, and sleeping well. Loads of pleasant, powerful dreams. As sunrise hit, I woke up proud, confident, uplifted. What a sweet spot and view! 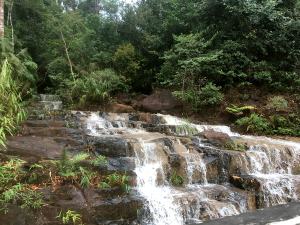 Being at the base of Bokor – about 6km from the entrance – meant I had hours I could explore Bokor National Park before needing to return. 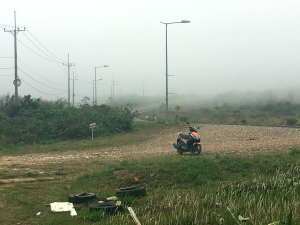 For those interested in camping in Bokor National Park, this is camping-friendly for sure. 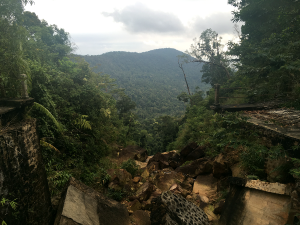 You can camp lower down on the mountain like I did, or explore the top parts of Bokor during daylight. There are so many spots you could successfully and comfortably camp, and there isn’t much security presence beyond their main checkpoints. 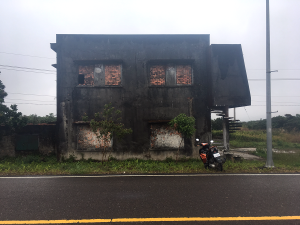 There is food, drinks, gas and even a casino at the top of Bokor, though it’s recommended you pack your own snacks for your camping experience. Kampot is extremely affordable. You can find a wide range of accommodation for $5-10 a day. Meals run a few dollars each. Scooters are $4-6 a day to rent, with gas $1 per litre. Green is readily available, of quality, and cheap! You’ll find good sized bags for $10. I routinely live off around USD$150 a week, and Kampot was easy enough to stay well under this threshold. Access to Phnom Penh is a $10-20 and 3-4 hour bus ride away, and Vietnam and Thailand are close as well. Very few places accept cards of any type. Cash is king. Both currencies – the US Dollar and Cambodia Riel – are routinely used in most transactions. Be wary of bank fees, almost on par with Thailand – $5-6 per withdrawal. 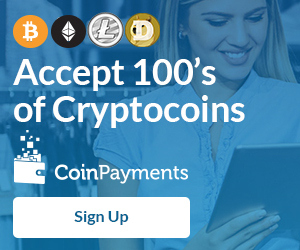 You’ll want to withdraw amounts like $70 or $90, or you’ll receive an entire $100 note, which can be challenging to use. Dollars are used as whole amounts, and you’ll receive Riel back as smaller change. The standard rate is USD$1 to KHR4000. So, a $7.50 bill that you pay for with a $10 bill, would net you $2 and KHR2000. It is customary to collect a stack of Riel. A couple of places purport to accept Bitcoin, including Subworks, though it wasn’t open when I ran into a major money issue (see below) and only had Bitcoin available. While US Dollars are widely accepted, be careful when you are issued change in USD. That is because if there is a defect like a tiny tear, or the note is too old (before 2006 I believe), NOBODY will accept it. This is compounded when you have an old USD100 from 1977 with a rip and a stamp, as I did. If this is your only cash then you’re going to find it is worthless. No money exchange or bank will take it. However, if you find an American heading back to the US, or are planning a visit yourself, the currency is still fine. 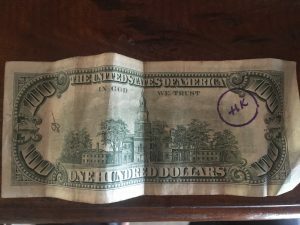 Any US bank will exchange it – but, as it’s not Cambodia’s currency,their own banks have no reason to take defective old notes. Some airport exchanges might offer a lesser rate for it. I repeat, when you take bank notes out of an ATM, try a denomination that will ensure smaller bills – for instance, $90. Anything $100+ and you will be receiving crisp new $100 notes, that are still challenging to break change. Despite South East Asia being home to some of the best food on the planet – Singapore, Malaysia, Thailand – Cambodian food is unspectacular. Most of what I ate was Western and other Asian food. The local dish I enjoyed the most is Chicken Amok – a coconut curry with rice. You can find “happy pizza” as well, where you will also find healthy bags of quality green from $10. Prices are excellent for food, but there is nothing to get too excited about at the local food stalls. 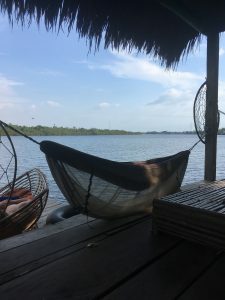 Kampot Cambodia is perfect for the digital nomad seeking superb weather, affordable food and accommodation, and a super relaxed atmosphere. If you earn recurring revenue from your digital business, you won’t need to stress too much about making enough sales to survive. Furthermore, if you’re in to 420 / green culture, there are few better places in the world than Kampot. 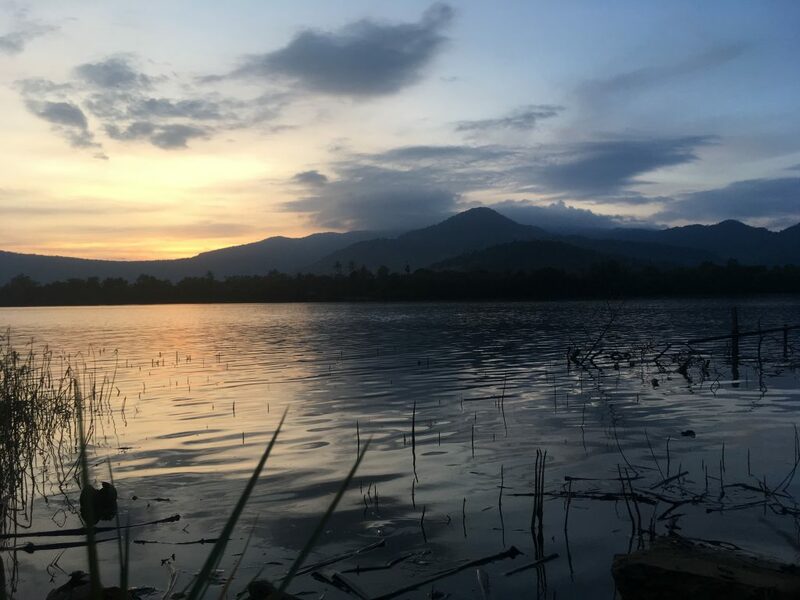 If you need something a little more interactive and driven, Kampot is worth a visit, but there are probably other places better suited to your needs.